Don't have a prescription? You can select the mask kit option and we will ship the minimum number of individual components needed to assemble a complete mask yourself. The Quattro Air Kit includes the mask frame with the cushion attached in one package and the headgear in another package. All that is required of the user is to attach the headgear. The Quattro™ Air is one of the lightest full face masks on the market. Weighing 45% less than its predecessor, it is lighter, sleeker and less bulky, and builds on the proven reliability and performance of the Quattro Series for a more comfortable therapy experience. Don't like the price, why pay more for a complete mask! Save money and order just the parts you need without a prescription! 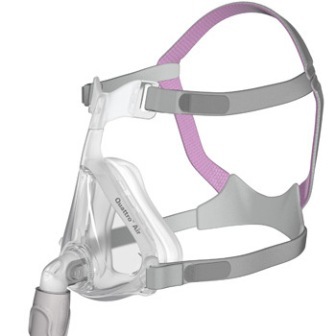 Click the link below for a complete line of replacement parts for the Quattro™ Air Full Face CPAP Mask.